Home Unlabelled STRAY DOG SHOCKS THE WHOLE COUNTRY BY DOING A MIRACLE!!! There is an incredible story which recently happened in Oman. 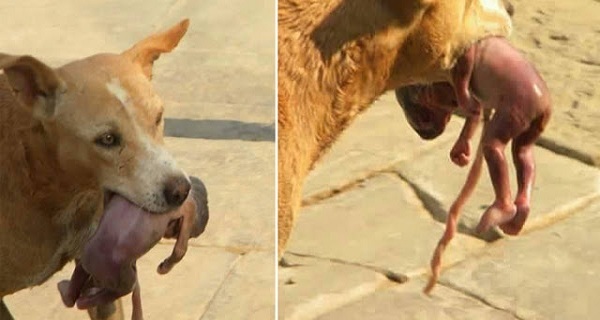 Namely, the whole country was shocked when they heard how a stray dog rescued a newborn baby. Oman authorities are now investigating this unbelievable incident which left the citizens speechless. This story was instantly spread around the Arab world through the social media. The incident took place in Kharbika, Oman. It was last Sunday morning when a man was riding his bike and he suddenly saw a stray dog walking on the road carrying something in his mouth. Also, he noticed a few blood drops on the road and he went closer in order to find out what was going on. He was totally shocked by what he saw! The dog was having a newborn baby in his mouth. It was a boy only a few hours old!!! The man reacted immediately run towards the dog in order to save the baby because he thought that the dog was going to kill the baby. However, the dog delivered the baby to him. People who meanwhile gathered around the scene were shocked by the dog`s reaction. The baby was immediately transferred to the hospital and the dog was wandering around there like it was expecting to find out how the child is. The doctors stated that the baby was not hurt despite the fact that the dog must have been carrying him for who know how long. The child was perfectly fine! The Oman authorities checked all the hospitals in order to see whether the dog has grabbed the baby from there. However, all the mothers had their babies. However, there were people who told the police that there was a girl who previously came to the emergency room but she refused to be examined by the doctors. Then she ran away from the hospital. The police suspects that this may be the mother of the newborn child and that she left him somewhere where people won`t find him. Fortunately, the dog found him!